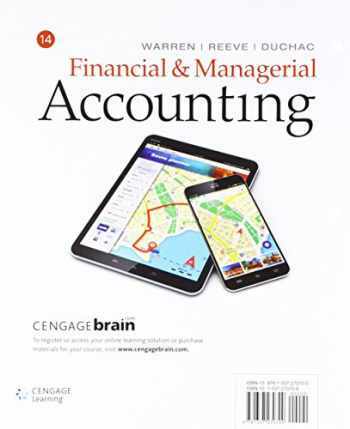 Acknowledged author Carl S. Warren wrote Bundle: Financial & Managerial Accounting, Loose-Leaf Version, 14th + CengageNOW™v2, 2 terms Printed Access Card comprising pages back in 2017. Textbook and etextbook are published under ISBN 1337591017 and 9781337591010. Since then Bundle: Financial & Managerial Accounting, Loose-Leaf Version, 14th + CengageNOW™v2, 2 terms Printed Access Card textbook received total rating of 4 stars and was available to sell back to BooksRun online for the top buyback price of $48.08 or rent at the marketplace.